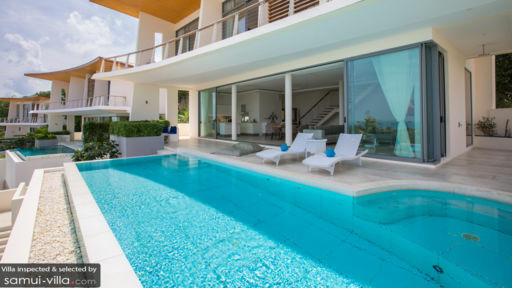 A modern home overlooking the azure waters of the ocean, Villa Merakai is a four-bedroom retreat with amenities such as a private swimming pool, terrace, open-plan living and dining areas. The villa features s striking façade with an all-white exterior accented by a slanting yellow roof. The striking blue water of the pool compliments the lush greenery that surrounds it. Guests can freely move around the villa as many of the major haunts are nearby such as Big Buddha, Fisherman’s Village, and the beach. The four bedrooms at Villa Merakai are located upstairs with three facing the stunning ocean view and one tucked away privately. As you ascend the steps leading from the living area, you leave behind the communal areas and retreat to a more private corner. Furnished with king-sized beds and one with twin beds appropriate for children as well. Designed with tropical colours, beautiful artwork, plush chairs, and wooden armoires, the bedrooms are elegant and luxurious. Amenities such as AC, TV, and satellite channels are available in each bedroom. 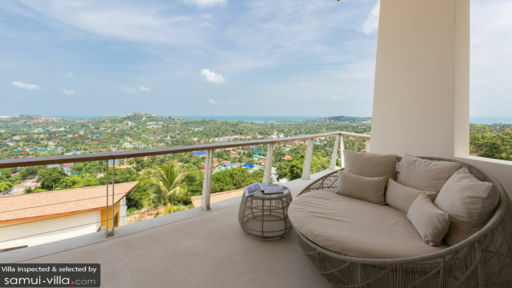 The three ocean-facing bedrooms are attached to the balcony that has outdoor seating from where you can enjoy the breathtaking views of Samui’s coastline. Each bedroom has an ensuite bathroom with walk-in showers and other amenities. An infinity swimming pool with sweeping views across land and water is the perfect place to relax and unwind during the daytime as the tropical breeze lightly grazes your skin and the tropical sun warms your insides. The pool deck is housed with recliner beds as well to sunbathe, nap, or read a book. You will be privy to spectacular sunsets and observe first-hand as the sky changes colours from blues to yellows to purples and then a littering of twinkling stars. Request the staff to set up a delicious BBQ outside to enjoy some freshly-grilled food with your friends and family. Slide open the floor-to-ceiling glass doors that lead directly to the open-concept living area at Villa Merakai. The simple décor indoors is accentuated by contemporary interiors such as the powdery-blue modular sofa, high ceilings, air-conditioning, and an entertainment unit. A flat-screen HD TV along with a DVD player and surround sound system will keep you occupied. There are some antique cabinets and vibrant artwork to bring the place to life. Leave the doors open for fresh air, stunning views across the ocean, and easy movement around the swimming pool. Behind the seating stands the dining area at the villa which can accommodate eight-guests with ease on the woven, jute chairs. The simplicity of this space matches the extravagance of its natural surroundings. The fully-equipped kitchen is also located towards the end of the living area with an open layout and state of the art facilities. The pristine white counters and cabinets, cherry-red appliances, a window overlooking lush greenery, and a mirrored splashback also reveal the prime aesthetic quality of the kitchen. The villa provides ample services to keep its guests happy and satisfied. Apart from the regular services of housekeeping and maintenance, you can even request for massages, babysitting, and a private chef for an additional cost. 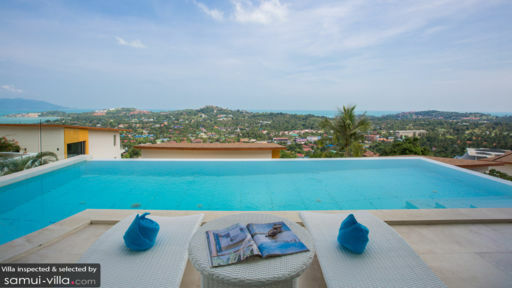 Nestled close to the beach, Villa Merakai offers prime access to some of the most popular tourist destinations in Samu such as Big Buddha, Fisherman’s Village, and a little further away you will reach the bustling neighbourhood of Choeng Mon with its boutique stores and restaurants.